Cloth fair is a medieval street in the heart of Smithfield which despite much alternation does retain some of its original character and atmosphere. It was one of the last streets in the city to maintain its medieval appearance, sadly mostly gone. The name 'Cloth fair' comes from the merchants who used to gathered to buy and sell goods during the Bartholomew market (one of these goods being cloth). Cloth fair through-out its history has had a strong relationship with the priory church of St Bartholomew which occupies most of the east side of the street. Until 1910 the street stood within the walls of the church with the gates locked every night creating a gated community. It was this gated community which helped the street avoided destruction in the great fire of London as the priory walls protected the area from being destroyed. 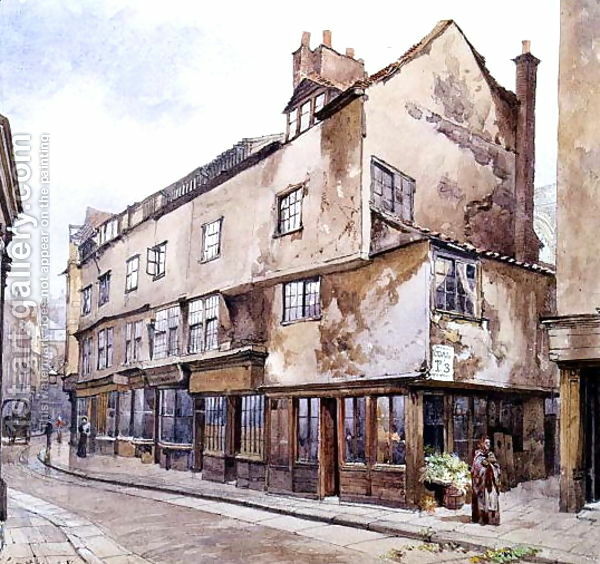 In the early seventeenth century many houses were built for merchants in the city, of which number 41&42 Cloth Fair is the only remaining example. 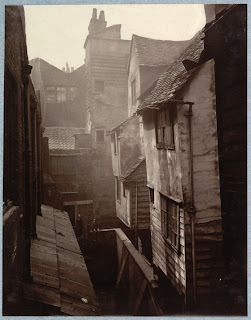 Although Cloth fair was a wealthy street in the medieval era with merchant housing by the Victorian period the street had developed like many other areas of inner-city London into slum dwellings. To a modern eye the buildings in the old pictures look picturesque and worthy of preservation, but one has to remember that they had very poor sanitation and many families shared small rooms in squalid conditions. The images left and below left © show the area in 1880, both are taken from the alley between the priory church and the back of the houses on the east side of Cloth Fair where today there is a patch of empty land. In the first picture the church buildings on the left and in the centre survive but those on the right have been demolished. Most of these ancient houses were demolished after the First World War and in the early 1920's during slum clearance schemes when sanitation was introduced and the area modernised by the Corporation of London. 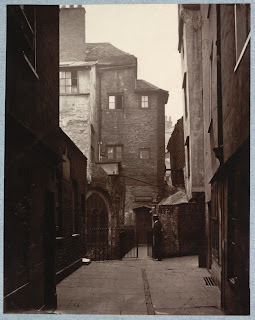 It seems a needless destruction of one of London's most historic medieval streets, however it is understandable why they were demolished as they were perceived as being old and costly to modernize and holding back progress. Despite this it is a shame they were not restored and retained as an example one of London's only surviving medieval streets. If these buildings had been retained it would have been one of the most important streets in England, comparable to elm hill in Norwich or the shambles in York. If only the planners of the early twentieth century had the foresight. Today we are left with still a splendid street but only a shadow of its former self. 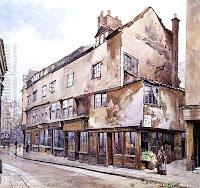 Of the old buildings in Cloth fair only one townhouse has survived which as previously mentioned is 41&42 Cloth Fair, known as the oldest house in London. As well another building attached to the church also survives (left and first 1880 picture). 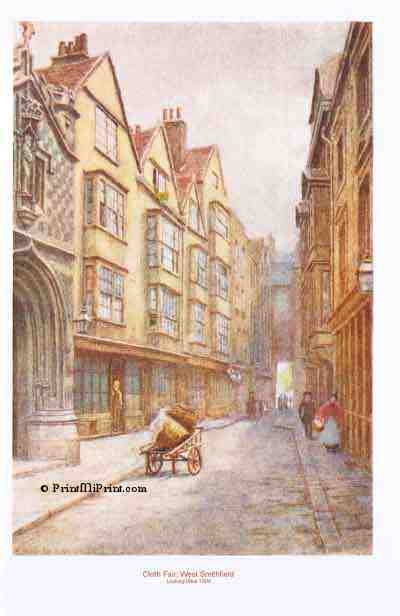 Of the buildings which were lost perhaps the most significant was the Whittington Inn which was the areas historic pub. 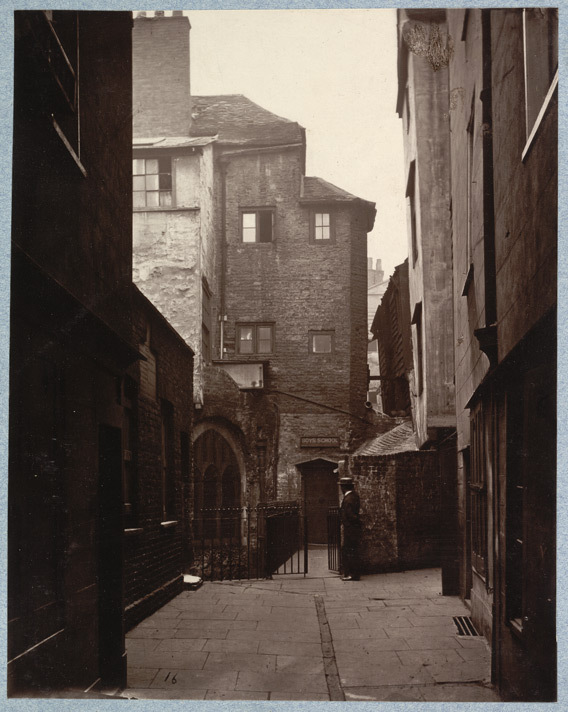 The below right © is a picture of 1884 showing the west side of the street standing in what is now the green space by the church of St Bartholomew's with 41&42 cloth fair opposite. By 1916 this set of buildings had been demolished (not by enemy action). Below left © is another view of the street around the same time.